It's 2 weeks into November.... and I have yet to post my November events- so HERE THEY ARE!! 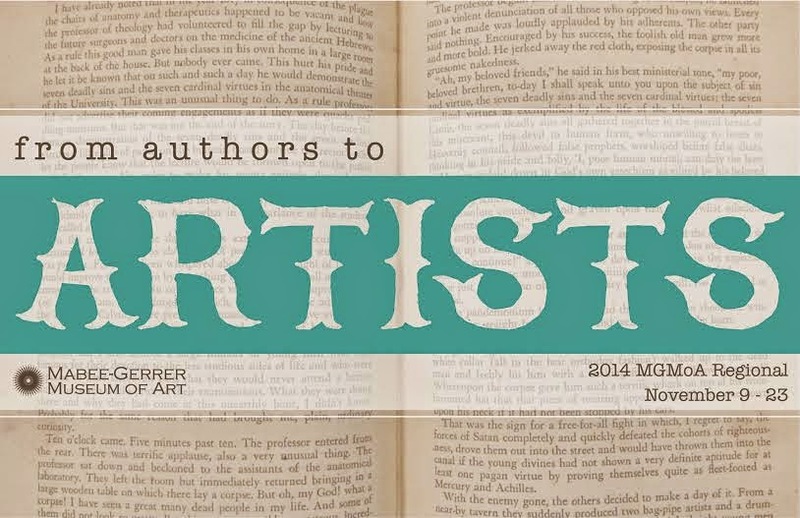 I have work at the Mabee-Gerror Museum of Art (in Shawnee, OK) in their 2014 Regional Exhibit- "From Authors to Artists" which runs until the end of the month. This event supports literacy in the region and they are waiving admission for anyone bringing in a book donation. My mixed media art piece includes pages from Robert Heinlein's work. GO NOW! 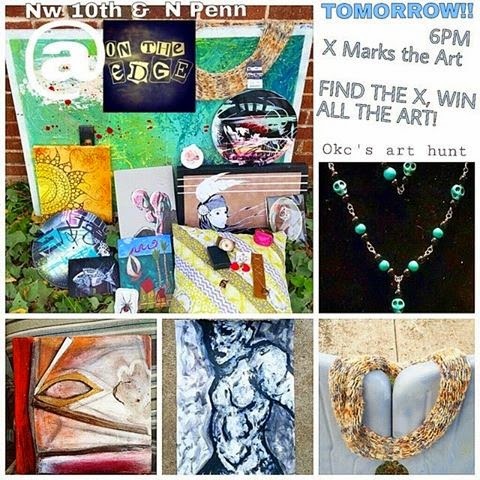 and check them out on Facebook and Twitter to get in on the fun and free art! This is a double-prize of art and extra big this time because there are extra treats rolled over from the Halloween art treasure hunt-- bonus!! So ...Where did the time go? Mostly I have been hiding in my studio working on sketches and preliminary stages art for 2015 shows. (spoiler alert- there are shifts, changes, and I am trying to push myself a lot-- is there such a thing as happy frustration?) Also I am trying to finish out as much as I can in my online shops for holiday buyers needing last-minute gifts. I am so very grateful for my international sales over the summer to Canada and the UK!! you folks have made my year and helped me learn so much about international selling and shipping- thank you for your business and patronage!! One of the many things people find out about me sooner or later is I am epileptic. The full-blown "floppin' around on the ground" (as Royal Tenenbaum would say) sort of seizures. *These are called tonic-clonic seizures now-a-days. Sometimes I also get auras and absence seizures but not as often (and people just think I am not paying attention or staring off into space... it is sort of awkward in some situations). Why is this a thing that matters to me? -Because I have lost jobs over it without ever having a seizure at work. -Because a large population around me still believes that, if I have a seizure, I might be possessed by a demon (wtf? ), just having a "fit" because I have a drug problem (false), diabetes (false), or thinks they need to shove a germ-covered object in my mouth to keep me from swallowing my tongue (impossible for this to actually happen). So I am pretty sure awareness is needed. When I made *myself* more aware of my condition, I learned about heroes who saved people during their seizures. I learned about Wesley Autrey, a man who jumped on subway tracks in New York when someone started having a seizure and fell off the platform. The train was coming and he was able to lay flat between the rails and the train as it passed over them.This is a TRUE STORY. I guess my point is...I am not stating that awareness is just for everyone else. 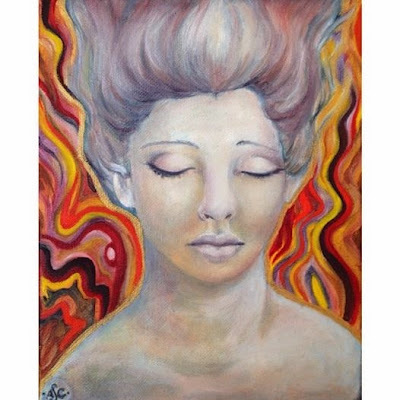 I have made art about epilepsy and my issues with it a few times. I will post a few pieces in the next few days. The elements in them vary as they are created at various points within my timeline. 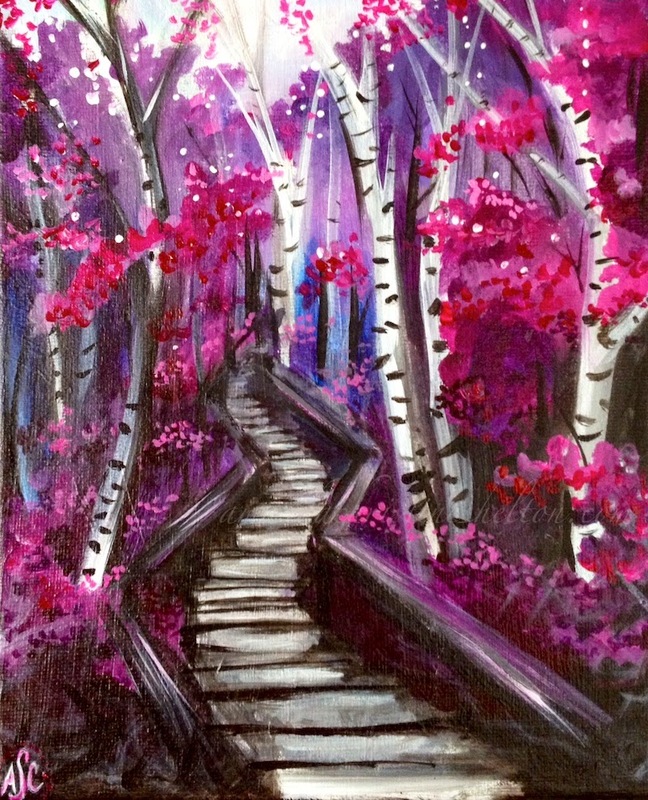 Awareness months typically are assigned colors also; I learned epilepsy has purple, so I painted a forest with a pathway of steps in purples last month, it is available in my Etsy shop. THIS PAGE of my official website.